As of the 2010 Census, Brickell Key consists of over 2800 residents. It is home to a five star hotel, office and retail, as well as, a public park. Brickell Key is largely regarded as paradise in the heart of Miami. It has come a long way from being an aggregation of discarded dredge material. Like so many islands found in Biscayne Bay, Brickell Key is a man-made creation. When the Brickells arrived to the south side of the Miami River in 1871, William Brickell built a home and trading post. The location of these buildings would later be referred to as Brickell Point. When the Brickells looked east from their home, they saw nothing but bay water from Brickell Point to the peninsula that would later become Miami Beach. It wasn’t until Henry Flagler began to develop the city of Miami in 1896 that that view started to change. Flagler’s team removed a sand bar at the mouth of the Miami River. 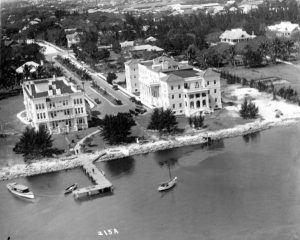 The team also used a dredge to deepen the river and bay adjacent to Flagler’s Royal Palm Hotel to create the first port of Miami. The dredging of the Miami River was a point of contention for William Brickell. As part of the effort to deepen the Miami River, those that Flagler put in charge of dredging began to dump limestone and river silt along and just off the shore east of the Brickell property. It was the discard off the shoreline that began to create the first of two spoil islands. 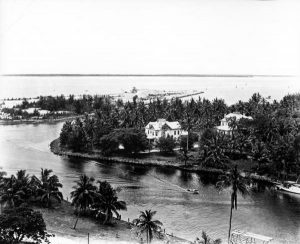 During the dredging of the Miami Canal in 1912, the larger of two spoil islands ended up being expanded with additional river discard. The downstream dredge activity created a lot of free river silt that made its way to the mouth of the Miami River. This silt was then gathered and dumped in the area of the spoil islands. At this time, a smaller spoil island was forming to the southeast of the larger island. It was believed to have come from digging out a vessel that went aground on that spot. By 1914, the widowed Mary Brickell was quite wealthy from land transactions. During the summer of that year, she had offered to remove the spoil islands at her own expense. The spoil islands were considered a nuisance and even Dr. James Jackson, the physician for the Royal Palm Hotel and later the namesake for Jackson Memorial Hospital, declared the islands to be a menace to the health and welfare of the public. The islands were considered unsightly, difficult to navigate and possessing an unpleasant odor. Mary Brickell had intended to pump the spoil material of the islands into some low lying areas on her property. However, there was enough opposition to her proposal that it was not accepted. The fate of the islands changed in 1916. By late spring, the Florida Internal Improvement Fund (FII), placed in ad to solicit bids for the land mass. Bids ranged from $10.10 to $3000 per acre for the five acre island. Mary Brickell’s bid was $750 for the entire parcel. Her bid was not the winning bid. On June 21st, 1916, the IIF trustees accepted the highest bid and ordered a deed to be issued to Mrs. M.R. Burlingame. Mrs. Burlingame was a business woman who moved to Miami from Michigan. She was one of the few women to own an advertising agency at the time. Mrs. Burlingame was a big proponent of promoting Miami as a year round living destination. It was her intention to annex the smaller spoil island and to ultimately build her home on the combined islands. However, prior to the end of June in 1916, Mary Brickell filed suit to challenge the deed issued to Mrs. Burlingame. The law suit filed by Mary Brickell was finally settled in 1918. The Florida Supreme Court declared in favor of Mrs. Burlingame and a deed was finally and officially issued. By 1920, Burlingame announced her intention to build a hotel or apartment house on the island. The island was referred to as Burlingame Island. In April of 1922, the War Department (later managed by the Army Corp of Engineers), issued a permit for a bulk head and fill of the five acre island. This work was scheduled to be complete by the end of 1922. However, by 1924, nothing was ever developed on the island. It was eventually sold to E.J. Reed of Miami, who filed for a permit to fill a much larger, triangular-shaped island. There was no evidence that this permit was ever granted, but the request provided a preview to how future plans would influence the shape of today’s Claughton Island. Through the remainder of the 1920s, not much had changed on Burlingame Island. There was no development and it was said that trees began taking over the topology. Some would say that the island belonged to the raccoons and rats. Ownership changed again in 1932 when R.P. Clark purchased the island. His dredging company was responsible for enlarging the island to 20.7 acres. Mr. Clark owned the island until January 1937. In November of 1943, Edward Claughton purchased the island. Edward Claughton was a well-known businessman who owned many properties and businesses in the Miami area. The properties included movie theaters and shopping centers in Allapattah. The Claughtons owned property in downtown Miami including the Urmey Hotel which was built in 1916 by William Urmey. They also owned the Silver Sands Motel on Key Biscayne. Edward Claughton passed away in 1955, and the island was inherited by his widow, Lillian, and two children, Edward Jr. and Suzanne. In 1965, the Claughtons got permission to enlarge the island to 44 acres. However, Lillian Claughton passed away in 1966. As a tribute to their parents, Edward Jr. and Suzanne officially renamed the island Claughton Island. By the early 1970s, many Miami residents speculated on the future of the island. Development may have been delayed because there was no way to access the island other than by boat. From the award of the island to Burlingame in 1916 through the 1950s, both Mary and Maude Brickell objected to the building of a bridge connecting the island to SE Eighth Street. Maude was the youngest of the eight Brickell children. Maude may have resisted a bridge given her feelings about how the island was created and how ownership was awarded to Burlingame. Another explanation may have been related to Brickell investments in the area. The Brickells built and owned the Brickell and Bulmer Apartments that resided along the bay at the eastern edge of SE Eighth Street. An increase in automobile traffic could have made both buildings less attractive to prospective renters. Regardless of the reason, the bridge from the island to the mainland did not get serious consideration until after Maude Brickell passed away in November of 1960. By the fall of 1974, the Claughtons entered into joint venture with Frates Properties of Tulsa, Oklahoma. The joint venture was created for the intention of development. The plan was to build two 300 room hotels, five office buildings, 2775 residential units in the form of condominiums and town homes. The plan also called for a multi-level shopping mall and marina. The agreement provided the Frates with two thirds ownership of the island. The Claughtons still owned the remaining one third of the island. The joint venture provided the Claughtons with enough capital to finally build a bridge from the island to the mainland. The investment in the bridge was allocated in accordance with the ownership percentage of the island. The Claughtons contributed one third of the investment and the Frates the remaining amount. The bridge was extended from the foot of SW 8th street to the island. The structure was a low fixed bridge that unfortunately blocked the passage of all but the smallest of boats. In January of 1979, a joint venture of Cheezem and Swire properties purchased the Frates ownership interest for $17 million. The new joint venture inherited the development order approved by the Miami City Commission in 1975. The development included a group of high rise condominiums, two hotels including the Mandarin Oriental, and over a million square feet of office space. Also developed was a 3.5 acre public park on the south side of the island. However, the park is considered temporary and will eventually be developed by Swire in the future. Swire Properties is the same company that is currently developing the Brickell CitiCentre. Construction is occurring on parcels of land between SE Eighth and SE Seventh Streets, just west of Brickell Key. The Claughtons continued to own their one third share of the island until the late 1990s. It was written into the deed during the sale of land that the land must officially be called “Claughton Island”. 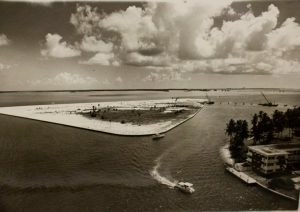 During the development of Claughton Island, it was decided that the name of the island should evolve to include Brickell Key in the name. The name of the island became “Brickell Key on Claughton Island”. The name change represented a bit of irony in that the Brickells largely considered the island a menace and an obstruction of their view of Biscayne Bay. 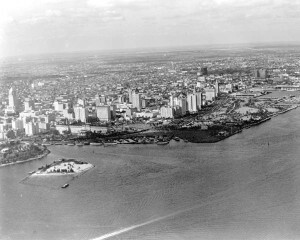 The spoil island began as a dumping ground for Flagler’s development of the north side of the river, something that had always aggravated William Brickell. 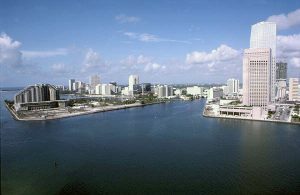 In addition, it represented an annoyance for Mary Brickell when her offer to either eliminate or buy the land mass was rejected. Based on these events, the island wasn’t something William, Mary or Maude would have ever envisioned carrying the Brickell name. Despite how the Brickells felt about the origins of the island, it has evolved nicely into a beautiful development from its humble beginnings. Not only do residents, office workers and hotel guests get to enjoy a well maintained island in the heart of a big city, but so do the surrounding residents. It is not uncommon to see runners or families enjoying a picturesque stroll around the pathways of the island. Brickell Key is part of Miami’s ever evolving skyline and an important part of the daily lives of so many modern day Miamians. A special thanks to Suzanne Claughton Schmidt for taking the time to provide more detail and corrections on the history of Claughton Island. Book: “The Miami River and Its Tributaries”, by Donald C. Gaby, Chapter 4, pp 23 – 26. Cover Photo: Brickell Key on Claughton Island. Courtesy of Brickell Key 411. Burlingame Island in 1928. Courtesy of Florida Memory. Burlingame Island in 1935. Courtesy of Florida Memory. Brickell and Bulmer Apartments in 1940s. Courtesy of Florida Memory. Claughton Island in 1972. Courtesy of HistoryMiami. Claughton Island in 1985. Courtesy of Florida Memory. 7 Comments on "Brickell Key on Claughton Island"
Great story.. I would also love to know the backstory of Grove Isle (we called it Grove Key). I remember it as a large sand bar covered with Australian Pines well into the 70’s but the difference was, it always had the Fair Isle Street bridge. It was the current bridge which just ended on the beach, the roadway hanging 10 feet up in the air. When I was in high school (Miami High ’67) we called it Fair Island, and it was where we would go and party on weekends sometimes. I remember that bridge drop well! That was about the time that the Grove was a hippie hangout, and we would go over to Fair Island for camping, drinking, smoking, and other fun pursuits. The police never bothered us over there, and we never caused any trouble. There are many errors in the above article about Claughton Island. For starters, Claughton Island is still the official name of the property. Brickell Key is the very large development on Claughton Island. A Bronze plaque by the gate on the bridge designates this. I know because I am the daughter of Edward N. Claughton, Sr. who was the purchaser in 1943, not my dear mother and brother as stated. Our family (my Mother, brother and myself) inherited the island in 1955 upon my father’s death. My Mother later passed away in 1966 and my brother and I became the sole owners and officially changed the name to Claughton Island. This was to honor our parents who had been very instrumental in the development of many properties in Miami. (These properties included movie theaters and shopping centers in Allapatah and in downtown Miami on the block they owned on S.E. First Street between 3rd Avevenue and Biscayne Blvd., the former Urmey Hotel on S.E. 2nd Ave., and the Silver Sands Motel on Key Biscayne. Our original joint venture on the island was to the Frates organization out of Clevelnd, Ohio (not to Cheezum as stated). to whom we sold 2/3 of the land. The funds we received enabled us to put up the money for our 1/3 share to build the bridge. Frates later sold their portion to Cheezum who in turn later sold to Swire. Our final sale of the remaining land we still owned was in the late 1990s and it was in our contract that the Island name must remain Claughton Island and could not be changed. The confusion has arisen because Swire opted to name their development Brickell Key and the word ‘key’ can mean ‘island’. Great read, thank you! I wrote a really interesting article about the history of Bill Baggs State Park and Key Biscayne if anyone is interested! Stavros, I will share your article with the Miami History social media community sites. Thank you for sharing. Just to add some sentimentality to the Claughton Island. My brother-in-law, Steve Alger worked for Mr. Claughton and a cabana was taken from Silver Sands motel and put on the Island around 1980. He lived there for about 10 years where got married while still living there and had two of his three children there. Eventually Mr. Claughton moved to Boone, North Carolina where Steve also moved. When Steve lived there he would have Bible studies and Christian gathering there. At that time there was no buildings at all. It was like heaven on earth for the young group from a little Christian fellowship called Lighthouse Christian Ministries.